Because of animation’s unlimited contingencies, one might wonder why it has taken so long to make a cartoon feature using one of those big treasure-hunting premises as source material. Surely you know what I’m referring to: the plots of countless live action films, such as “Romancing The Stone” and “The Mummy,” in which characters go in search of legendary artifacts and must dodge hazardous obstacles, take risks and battle villains in order to save their own lives. The feats that certain individuals accomplish on screen (like swinging on vines from one side of a cliff to another while a hot pit of lava is just below) frequently look laughable because—let’s face it—live action has its logical restrictions. Isn’t it apparent, then, that a style as eternal as animation could take these approaches and make all sorts of ludicrous actions look believable? You’d think so, wouldn’t you? But that audacious tone has finally found its way into the animated genre with “The Road To El Dorado,” Dreamworks’ follow-up to “The Prince Of Egypt.” Don’t break out the champagne just yet, though, because a newfangled approach is not always the equivalent of a successful picture. So is the case with this flick, a disappointing and largely aloof animated production that, while offering a highly stylized visual treatment, is scarce on depth and not very entertaining. The movie is a tiring exercise in mediocrity; a droll, pretentious and unimaginative adventure comedy with no stable character at the center of its story. Many might take that as a surprise, considering the talent that is fastened to the project. Take the writers, for instance: Ted Elliot and Terry Rossio previously worked on the scripts for Disney’s “Aladdin” and TriStar’s “The Mask Of Zorro,” easily two of the most venturesome films of the past few years. And the songwriters, Elton John and Tim Rice, are famous for their vibrant score to the animated hit “The Lion King.” Merging both of these teams might have seemed like a good idea to the studio; who would have thought they’d settle for a product as flat as this one, though? Maybe Dreamworks isn’t the big competitor to Disney animation it thinks it is. The story tells of two Spanish con men named Miguel and Tulio, who stow away on a ship headed for the New World, but are caught and put in restraints to await eventual torture from the ship’s captain, Hernando Cortez. By using the arrival of Cortez to the New World as a backdrop for the events to come, the writers are treading water with historians, who will closely inspect the movie for any particular misconduct to history. Whether or not the movie makes historical inaccuracies is beside the point, though; animation is for telling stories, not for preserving facts. Before anything actually happens, both guys make a quick escape, hijack a boat, and head for land. Why, you ask? Because they have recently acquired a map to the lost golden city of El Dorado, and are determined to make it there without anything standing in their way. Coincidentally (! ), the shore they wash up is one of the paths towards the city; without much hesitation, they immediately set out on foot for it. The journey itself is brief; just a few minutes after it begins, the city is discovered. 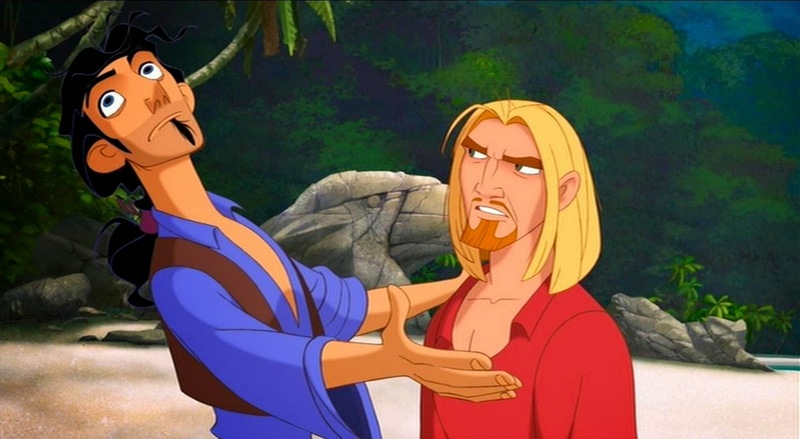 But that’s not the only thing; Miguel and Tulio, you see, also learn that this gold city is inhabited by peaceful Indians, who believe that the two young men who have walked in are actually gods. Being the fools that they are, both con artists play along with the race’s suspicions, if only so they have enough time to get their hands on some gold and make a quick getaway. In the process, however, a woman named Chel discovers their true identities. She offers to help in their masquerade, nonetheless, as long as they take her back to Spain with them. There are lots of characters, but none of them have been written with enough complexity to win our admiration. Kevin Kline and Kenneth Branagh are the voices behind the two crooks, but little of their chemistry works because of the transparency of their personas; Chel, who is voiced by Rosie Perez, is like excess baggage in a plot that demands little need for a sidekick; and the villain Tzekel-Kan, voiced by Armand Assante, lacks a sense of ruthlessness and power. The only thing going for the movie is its terrific animation, which, at times, even surpasses the most visionary moments in “The Prince Of Egypt.” The best sequence is towards the end, in which the heroes are forced to defend El Dorado against the onslaught brought on by the abrupt arrival of Cortez and his crew; appreciation is limited, naturally, because we couldn’t care less about the characters involved in the battle. “The Road To El Dorado” is certainly not the worst animated film in recent memory (that honor is bestowed upon “The King And I”) but it is one of the most disappointing, in the sense that it uses a new approach but lacks the energy and ambition to match breathtaking animation with an exciting story. My suggestion: wait until this winter for Disney’s new animated feature, “The Emperor’s New Groove,” (formerly known as “Kingdom Of The Sun”) to get released. Waiting for a potentially rewarding adventure cartoon would be better than substituting it with a hollow mess like this.